Over time your teeth can wear down and may even become chipped or broken, and certain fillings or root canal treatments may cause discoloration. Antibiotic treatments during childhood can accelerate staining of adult teeth, and whitening gels can’t help this problem. You may also be up against irregularly shaped, misaligned teeth, gaps, or pitting. Alas, this is a fact of life. Simple whitening treatments can help some discoloration, braces can fix severely crowded and misaligned teeth, and crowns can disguise broken teeth. But you may have other options. At East Tennessee Prosthodontics, we often use dental veneers to correct cases of chipped teeth, discoloration, minor misalignment, or gaps. 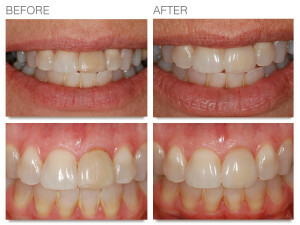 Porcelain veneers offer a tried and true method for enhancing your smile. Thin as a contact lens, their ceramic construction can make teeth appear perfectly aligned, natural, and bright. Developing and placing porcelain veneers usually takes two to three visits, but the actual application is simple. At East Tennessee Prosthodontics, we begin with our Smile Design process to determine the proper size, shape and position of teeth within the frame of your lips. 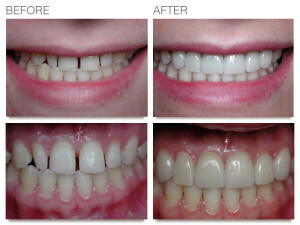 We then develop a detailed plan to provide you with the most conservative and realistic option to rebuild your smile. Once the plan is finalized, a very thin layer of enamel, similar in thickness to the veneer, is removed from the teeth, and the teeth are prepared to receive the veneers. 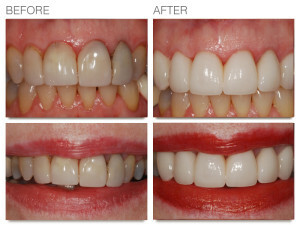 Your custom-made porcelain veneers will fit the unique form of your mouth and bond to your teeth with a special adhesive. 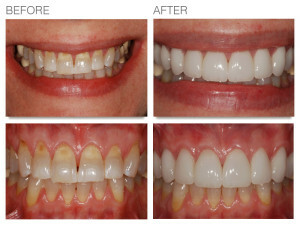 Dental veneers require only the same oral hygiene as your original teeth and can last for many years. If replacements become necessary in the future, that procedure is also simple. If you dislike the gaps, chips, or misalignment of your teeth, then call 865-769-0886 to schedule a time to talk about whether veneers are the right option for you. They just might give you that great smile you’ve always wanted. Click here to keep reading about cosmetic dentistry.